The Challenge: Pick a sewing or fabric project from Pinterest. Make it, share it, inspire. This week my readers and I are sharing Pinterest inspired projects. I want you to get involved, too. 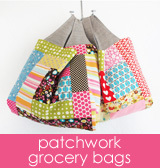 Find a Pinterest sewing or fabric project to make. Then share it on the giveaway post for your chance to win a fabric giveaway sponsored by Fabricworm. This bag is awesome. I see this bag pinned over and over on pinterest, so obviously I'm not the only one who loves it. Being of somewhat reserved nature, I probably wouldn't carry a bag this bright and flashy, but I do enjoy looking at it and thought it would be fun to make something similar! And yes, I'm probably not going to be carrying this one around either. But it was fun to make and a good sewing experience. I also have quite a few solid scraps, so this was a great project to put them to use. I don't have a lot of patchwork practice, and while it seems like it should be easy, there was a surprising amount of second guessing and general procrastination. Since this was sort of new to me, I wanted to use an existing pattern and not spend time a bunch of time designing a new bag. So this is the Bucket Bag pattern, but without the front pocket. Add patches of fabric. 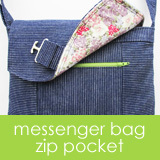 The original bag has patches of fabric sew onto the base fabric. You can vaguely see the frayed edges. In general, I don't like the idea of frayed fabric with loose threads. Enough of my time is spent sweeping up thread, brushing it off my clothes, and sometimes even plucking it out of my hair. So it isn't easy for me to get excited about having frayed edges as a design detail. The loose ends might distract me too much. 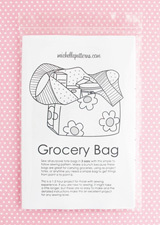 But I do love how the patches of fabric look on the inspiration bag, and the depth they give the fabric. It isn't possible to get that look just through patchwork piecing, so next time I try to overcome my peevishness about frayed edges. Give myself more time. I'm constantly running behind, so I only had the weekend to get my bag done. It took some time to make the patchwork pieces, and I wish I'd had more time for planning. Improv sewing is fun, but when you invest a lot of time in the piecing and quilting it is probably better to plan a bit more than I did. Hand quilting. I love the hand quilting details on the inspiration bag and definitely want to do some hand stitching on my next piece of patchwork. This also goes back to giving myself more time.